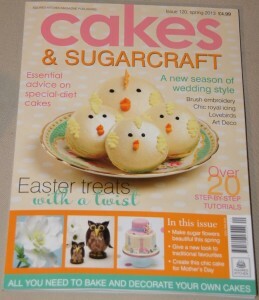 I was very lucky to receive a magazine subscription of my choice for Christmas (thanks Dot & Martin!) and after a bit of research I opted for Cakes & Sugarcraft. Now after a bit of a rough day at work it was very exciting to arrive home this evening to find the Spring edition waiting for me. I’ve only had a quick flick through but I’m already excited and keen to get experimenting.